This article is about the modern country near the Persian Gulf. For the former autonomous state in southern Arabia, see Qu'aiti. For the city, see Kuwait City. Kuwait (/kʊˈweɪt/ ( listen); Arabic: الكويت‎ al-Kuwait, Gulf Arabic pronunciation: [ɪl‿ɪkweːt] or [lɪkweːt]), officially the State of Kuwait (Arabic: دولة الكويت‎ Dawlat al-Kuwait), is a country in Western Asia. Situated in the northern edge of Eastern Arabia at the tip of the Persian Gulf, it shares borders with Iraq and Saudi Arabia. As of 2016[update], Kuwait has a population of 4.5 million people: 1.3 million are Kuwaitis and 3.2 million are expatriates. Expatriates account for 70% of the population. Oil reserves were discovered in commercial quantities in 1938. From 1946 to 1982, the country underwent large-scale modernization. In the 1980s, Kuwait experienced a period of geopolitical instability and an economic crisis following the stock market crash. In 1990, Kuwait was invaded, and later annexed, by Saddam's Iraq. The Iraqi occupation of Kuwait came to an end in 1991 after military intervention by a military coalition led by the United States. 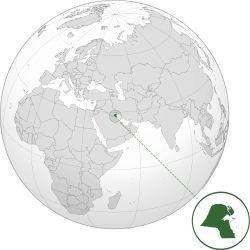 Kuwait is a major non-NATO ally of the United States. It is also a major ally of ASEAN, while maintaining a strong relationship with China. Kuwait is a constitutional sovereign state with a semi-democratic political system. Kuwait has a high-income economy backed by the world's sixth largest oil reserves. According to the World Bank, the country has the fourth highest per capita income. The Constitution was promulgated in 1962. Kuwait is home to the largest opera house in the Middle East. The Kuwait National Cultural District is a member of the Global Cultural Districts Network. In 1613, the town of Kuwait was founded in modern-day Kuwait City. Administratively, it was a sheikhdom, ruled by local sheikhs. In 1716, the Bani Utub settled in Kuwait, which at this time was inhabited by a few fishermen and primarily functioned as a fishing village. In the eighteenth century, Kuwait prospered and rapidly became the principal commercial center for the transit of goods between India, Muscat, Baghdad and Arabia. By the mid 1700s, Kuwait had already established itself as the major trading route from the Persian Gulf to Aleppo. During the Persian siege of Basra in 1775–79, Iraqi merchants took refuge in Kuwait and were partly instrumental in the expansion of Kuwait's boat-building and trading activities. As a result, Kuwait's maritime commerce boomed, as the Indian trade routes with Baghdad, Aleppo, Smyrna and Constantinople were diverted to Kuwait during this time. The East India Company was diverted to Kuwait in 1792. The East India Company secured the sea routes between Kuwait, India and the east coasts of Africa. After the Persians withdrew from Basra in 1779, Kuwait continued to attract trade away from Basra. Kuwait was the center of boat building in the Persian Gulf region. During the late eighteenth and nineteenth centuries, vessels made in Kuwait carried the bulk of trade between the ports of India, East Africa and the Red Sea. Kuwaiti ships were renowned throughout the Indian Ocean. Regional geopolitical turbulence helped foster economic prosperity in Kuwait in the second half of the 18th century. Perhaps the biggest catalyst for much of Kuwait becoming prosperous was due to Basra's instability in the late 18th century. In the late 18th century, Kuwait partly functioned as a haven for Basra's merchants, who were fleeing Ottoman government persecution. Kuwaitis developed a reputation as the best sailors in the Persian Gulf. In the 1890s, Kuwait began to feel threatened by the Ottoman empire. in a bid to address its security issues, the then ruler, Sheikh Mubarak Al Sabah signed an agreement with the British government in India, subsequently known as the Anglo-Kuwaiti Agreement of 1899 and became a British protectorate. The Sheikhdom of Kuwait remained a British protectorate from 1899 (until 1961). Following the Kuwait–Najd War of 1919–20, Ibn Saud imposed a trade blockade against Kuwait from the years 1923 until 1937. 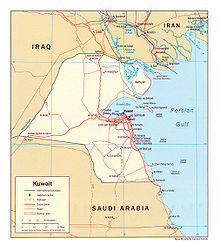 The goal of the Saudi economic and military attacks on Kuwait was to annex as much of Kuwait's territory as possible. At the Uqair conference in 1922, the boundaries of Kuwait and Najd were set; as a result of British interference, Kuwait had no representative at the Uqair conference. Ibn Saud persuaded Sir Percy Cox to give him two-thirds of Kuwait's territory. More than half of Kuwait was lost due to Uqair. After the Uqair conference, Kuwait was still subjected to a Saudi economic blockade and intermittent Saudi raiding. The Great Depression harmed Kuwait's economy, starting in the late 1920s. International trading was one of Kuwait's main sources of income before oil. Kuwaiti merchants were mostly intermediary merchants. As a result of the decline of European demand for goods from India and Africa, Kuwait's economy suffered. The decline in international trade resulted in an increase in gold smuggling by Kuwaiti ships to India. Some Kuwaiti merchant families became rich from this smuggling. Kuwait's pearl industry also collapsed as a result of the worldwide economic depression. At its height, Kuwait's pearl industry had led the world's luxury market, regularly sending out between 750 and 800 ships to meet the European elite's desire for pearls. During the economic depression, luxuries like pearls were in little demand. The Japanese invention of cultured pearls also contributed to the collapse of Kuwait's pearl industry. Historian Hanna Batatu explains how the British threatened to take the Kurdish area and Mosul out of Iraq provided that King Faisal granted Britain control of the oil in the region. In 1938 the Kuwaiti Legislative Council unanimously approved a request for Kuwait’s reintegration with Iraq. A year later an armed uprising which had raised the integration banner as its objective was put down by the British. With the end of the world war, and increasing need for oil across the world, Kuwait experienced a period of prosperity driven by oil and its liberal atmosphere. The period of 1946-82 is often termed "the golden period of Kuwait" by western academics. In popular discourse, the years between 1946 and 1982 are referred to as the "Golden Era". However, Kuwaiti academics argue that this period was marked by benefits accruing only to the wealthier and connected ruling classes. It saw an increased presence of British, American and French citizens connected with the new oil industry, wealth transfer to people connected with the Emir, the creation of a new privileged upper class of educated Kuwaitis, bankers, and a vast majority of Kuwaitis living a life of penury. This resulted in a growing gulf between the wealthy minority and the majority of common citizens. In 1950, a major public-work programme began to enable Kuwaitis to enjoy a modern standard of living. By 1952, the country became the largest oil exporter in the Persian Gulf region. This massive growth attracted many foreign workers, especially from Palestine, India, and Egypt – with the latter being particularly political within the context of the Arab Cold War. In June 1961, Kuwait became independent with the end of the British protectorate and the Sheikh Abdullah Al-Salim Al-Sabah became Emir of Kuwait. Kuwait's national day, however, is celebrated on 25 February, the anniversary of the coronation of Sheikh Abdullah (it was originally celebrated on 19 June, the date of independence, but concerns over the summer heat caused the government to move it). Under the terms of the newly drafted Constitution, Kuwait held its first parliamentary elections in 1963. Kuwait was the first of the Arab states of the Persian Gulf to establish a constitution and parliament. In the 1960s and 1970s, Kuwait was considered by some as the most developed country in the region. Kuwait was the pioneer in the Middle East in diversifying its earnings away from oil exports. The Kuwait Investment Authority is the world's first sovereign wealth fund. From the 1970s onward, Kuwait scored highest of all Arab countries on the Human Development Index. Kuwait University was established in 1966. Kuwait's theatre industry was well known throughout the Arab world. However, it also began to see the growth of plush gated properties , wherein the interiors resembled western villas and the streets were filled with roads marked with potholes. Kuwaiti society embraced liberal and Western attitudes throughout the 1960s and 1970s. For example, most Kuwaiti women did not wear the hijab in the 1960s and 70s. During the Iran–Iraq War, Kuwait supported Iraq. Throughout the 1980s, there were several terror attacks in Kuwait, including the 1983 Kuwait bombings, hijacking of several Kuwait Airways planes and the attempted assassination of Emir Jaber in 1985. Kuwait was a regional hub of science and technology in the 1960s and 1970s up until the early 1980s; the scientific research sector significantly suffered due to the terror attacks. After the Iran–Iraq War ended, Kuwait declined an Iraqi request to forgive its US$65 billion debt. An economic rivalry between the two countries ensued after Kuwait increased its oil production by 40 percent. Tensions between the two countries increased further in July 1990, after Iraq complained to OPEC claiming that Kuwait was stealing its oil from a field near the border by slant drilling of the Rumaila field. In August 1990, Iraqi forces invaded and annexed Kuwait. After a series of failed diplomatic negotiations, the United States led a coalition to remove the Iraqi forces from Kuwait, in what became known as the Gulf War. On 26 February 1991, the coalition succeeded in driving out the Iraqi forces. As they retreated, Iraqi forces carried out a scorched earth policy by setting oil wells on fire. During the Iraqi occupation, more than 1,000 Kuwaiti civilians were killed. In addition, more than 600 Kuwaitis went missing during Iraq's occupation; remains of approximately 375 were found in mass graves in Iraq. In March 2003, Kuwait became the springboard for the US-led invasion of Iraq. Upon the death of the Emir Jaber in January 2006, Saad Al-Sabah succeeded him but was removed nine days later by the Kuwaiti parliament due to his ailing health. Sabah Al-Sabah was sworn in as Emir. From 2001 to 2009, Kuwait had the highest Human Development Index ranking in the Arab world. In 2005, women won the right to vote and run in elections. In 2014 and 2015, Kuwait was ranked first among Arab countries in the Global Gender Gap Report. Sabah Al Ahmad Sea City was inaugurated in mid 2015. The Amiri Diwan is currently developing the new Kuwait National Cultural District (KNCD), which comprises Sheikh Abdullah Al Salem Cultural Centre, Sheikh Jaber Al Ahmad Cultural Centre, Al Shaheed Park, and Al Salam Palace. With a capital cost of more than US$1 billion, the project is one of the largest cultural investments in the world. In November 2016, the Sheikh Jaber Al Ahmad Cultural Centre opened. It is the largest cultural centre in the Middle East. The Kuwait National Cultural District is a member of the Global Cultural Districts Network. Kuwaiti popular culture, in the form of theatre, radio, music, and television soap opera, flourishes and is even exported to neighboring states. Within the Persian Gulf Arab states, the culture of Kuwait is the closest to the culture of Bahrain; this is evident in the close association between the two states in theatrical productions and soap operas. Kuwaiti society is markedly more open than other Persian Gulf Arab societies. Kuwaiti citizens are ethnically diverse, consisting of both Arabs and Persians ('Ajam). Kuwait stands out in the region as the most liberal in empowering women in the public sphere. Kuwaiti women outnumber men in the workforce. Kuwaiti political scientist Ghanim Alnajjar sees these qualities as a manifestation of Kuwaiti society as a whole, whereby in the Persian Gulf region it is "the least strict about traditions". Abdulhussain Abdulredha, the most prominent Kuwaiti actor. Kuwait's television drama industry tops other Persian Gulf drama industries and produces a minimum of fifteen serials annually. Kuwait is the production centre of the Persian Gulf television drama and comedy scene. Most Persian Gulf television drama and comedy productions are filmed in Kuwait. Kuwaiti soap operas are the most-watched soap operas from the Gulf region. Soap operas are most popular during the time of Ramadan, when families gather to break their fast. Although usually performed in the Kuwaiti dialect, they have been shown with success as far away as Tunisia. Kuwait is frequently dubbed the "Hollywood of the Gulf" due to the popularity of its television soap operas and theatre. Kuwait is known for its home-grown tradition of theatre. Kuwait is the only country in the Persian Gulf with a theatrical tradition. The theatrical movement in Kuwait constitutes a major part of the country's cultural life. Theatrical activities in Kuwait began in the 1920s when the first spoken dramas were released. Theatre activities are still popular today. Abdulhussain Abdulredha is the most prominent actor. Kuwait is the main centre of scenographic and theatrical training in the Persian Gulf region. In 1973, the Higher Institute of Theatrical Arts was founded by the government to provide higher education in theatrical arts. The institute has several divisions. Many actors have graduated from the institute, such as Souad Abdullah, Mohammed Khalifa, Mansour Al-Mansour, along with a number of prominent critics such as Ismail Fahd Ismail. Theatre in Kuwait is subsidized by the government, previously by the Ministry of Social Affairs and now by the National Council for Culture, Arts, and Letters (NCCAL). Every urban district has a public theatre. The public theatre in Salmiya is named after Abdulhussain Abdulredha. Kuwait has the oldest modern arts movement in the Arabian Peninsula. Beginning in 1936, Kuwait was the first Persian Gulf country to grant scholarships in the arts. The Kuwaiti artist Mojeb al-Dousari was the earliest recognized visual artist in the Gulf region. He is regarded as the founder of portrait art in the region. The Sultan Gallery was the first professional Arab art gallery in the Gulf. Kuwait is home to more than 30 art galleries. In recent years, Kuwait's contemporary art scene has boomed. Khalifa Al-Qattan was the first artist to hold a solo exhibition in Kuwait. He founded a new art theory in the early 1960s known as "circulism". Other notable Kuwaiti artists include Sami Mohammad, Thuraya Al-Baqsami and Suzan Bushnaq. The government organizes various arts festivals, including the Al Qurain Cultural Festival and Formative Arts Festival. The Kuwait International Biennial was inaugurated in 1967, more than 20 Arab and foreign countries have participated in the biennial. Prominent participants include Layla Al-Attar. In 2004, the Al Kharafi Biennial for Contemporary Arab Art was inaugurated. Kuwait is the birthplace of various popular musical genres, such as sawt. Kuwaiti music has considerably influenced the music culture in other GCC countries. Traditional Kuwaiti music is a reflection of the country's seafaring heritage, which is known for genres such as fijiri. Kuwait pioneered contemporary Khaliji music. Kuwaitis were the first commercial recording artists in the Gulf region. The first known Kuwaiti recordings were made between 1912 and 1915. The Sheikh Jaber Al-Ahmad Cultural Centre contains the largest opera house in the Middle East. Kuwait is home to various music festivals, including the International Music Festival hosted by the National Council for Culture, Arts and Letters (NCCAL). Kuwait has several academic institutions specializing in university-level music education. The Higher Institute of Musical Arts was established by the government to provide bachelor's degrees in music. In addition, the College of Basic Education offers bachelor's degrees in music education. The Institute of Musical Studies offers degrees equivalent to secondary school. Kuwait has, in recent years, produced several prominent contemporary writers such as Ismail Fahd Ismail, author of over twenty novels and numerous short story collections. There is also evidence that Kuwaiti literature has long been interactive with English and French literature. The new Kuwait National Cultural District (KNCD) consists of various cultural venues including Sheikh Abdullah Al Salem Cultural Centre, Sheikh Jaber Al Ahmad Cultural Centre, Al Shaheed Park, and Al Salam Palace. With a capital cost of more than US$1 billion, it is one of the largest cultural districts in the world. The Abdullah Salem Cultural Centre is the largest museum complex in the Middle East. The Kuwait National Cultural District is a member of the Global Cultural Districts Network. Several Kuwaiti museums are devoted to Islamic art, most notably the Tareq Rajab Museums and Dar al Athar al Islamiyyah cultural centres. The Dar al Athar al Islamiyyah cultural centres include education wings, conservation labs, and research libraries. There are several art libraries in Kuwait. Khalifa Al-Qattan's Mirror House is the most popular art museum in Kuwait. Many museums in Kuwait are private enterprises. In contrast to the top-down approach in other Gulf states, museum development in Kuwait reflects a greater sense of civic identity and demonstrates the strength of civil society in Kuwait, which has produced many independent cultural enterprises. Sadu House is among Kuwait's most important cultural institutions. Bait Al-Othman is the largest museum specializing in Kuwait's history. The Scientific Center is one of the largest science museums in the Middle East. The Museum of Modern Art showcases the history of modern art in Kuwait and the region. The National Museum, established in 1983, has been described as "underused and overlooked". Football is the most popular sport in Kuwait. The Kuwait Football Association (KFA) is the governing body of football in Kuwait. The KFA organises the men's, women's, and futsal national teams. The Kuwaiti Premier League is the top league of Kuwaiti football, featuring eighteen teams. They have been the champions of the 1980 AFC Asian Cup, runners-up of the 1976 AFC Asian Cup, and have taken third place of the 1984 AFC Asian Cup. Kuwait has also been to one FIFA World Cup, in 1982; they drew 1–1 with Czechoslovakia before losing to France and England, failing to advance from the first round. Kuwait is home to many football clubs including Al-Arabi, Al-Fahaheel, Al-Jahra, Al-Kuwait, Al-Naser, Al-Salmiya, Al-Shabab, Al Qadsia, Al-Yarmouk, Kazma, Khaitan, Sulaibikhat, Sahel, and Tadamon. The biggest football rivalry in Kuwait is between Al-Arabi and Al Qadsia. Basketball is one of the country's most popular sports. The Kuwait national basketball team is governed by the Kuwait Basketball Association (KBA). Kuwait made its international debut in 1959. The national team has been to the FIBA Asian Championship in basketball eleven times. The Kuwaiti Division I Basketball League is the highest professional basketball league in Kuwait. Cricket in Kuwait is governed by the Kuwait Cricket Association. Other growing sports include rugby union. Handball is widely considered to be the national icon of Kuwait, although football is more popular among the overall population. Ice hockey in Kuwait is governed by the Kuwait Ice Hockey Association. Kuwait first joined the International Ice Hockey Federation in 1985, but was expelled in 1992 due to a lack of ice hockey activity. Kuwait was re-admitted into the IIHF in May 2009. In 2015, Kuwait won the IIHF Challenge Cup of Asia. The 372 m tall Kuwait Telecommunications Tower (leftmost) is the main communication tower of Kuwait. Kuwait's media is annually classified as "partly free" in the Freedom of Press survey by Freedom House. Since 2005, Kuwait has frequently earned the highest ranking of all Arab countries in the annual Press Freedom Index by Reporters Without Borders. In 2009, 2011, 2013 and 2014, Kuwait surpassed Israel as the country with the greatest press freedom in the Middle East. Kuwait is also frequently ranked as the Arab country with the greatest press freedom in Freedom House's annual Freedom of Press survey. Kuwait produces more newspapers and magazines per capita than its neighbors. There are limits to Kuwait's press freedom; while criticism of the government and ruling family members is permitted, Kuwait's constitution criminalizes criticism of the Emir. The state-owned Kuwait News Agency (KUNA) is the largest media house in the country. The Ministry of Information regulates the media industry in Kuwait. Kuwait has 15 satellite television channels, of which four are controlled by the Ministry of Information. State-owned Kuwait Television (KTV) offered first colored broadcast in 1974 and operates five television channels. Government-funded Radio Kuwait also offers daily informative programming in several foreign languages including Arabic, Farsi, Urdu, and English on the AM and SW.
Kuwait is a constitutional emirate with a semi-democratic political system. The Emir is the head of state. The hybrid political system is divided between an elected parliament and appointed government. The Constitution of Kuwait was promulgated in 1962. Kuwait is among the Middle East's freest countries in civil liberties and political rights. Freedom House rates the country as "Partly Free" in the Freedom in the World survey. The Constitution of Kuwait is considered as a liberal constitution in the GCC. It guarantees a wide range of civil liberties and rights. In contrast to other states in the region, the political process largely respects constitutional provisions. Kuwait has a robust public sphere and active civil society with political and social organizations that are parties in all but name. Professional groups like the Chamber of Commerce maintain their autonomy from the government. The National Assembly is the legislature and has oversight authority. The National Assembly consists of fifty elected members, who are chosen in elections held every four years. Since the parliament can conduct inquiries into government actions and pass motions of no confidence, checks and balances are robust in Kuwait. The parliament can be dissolved under a set of conditions based on constitutional provisions. The Constitutional Court and Emir both have the power to dissolve the parliament, although the Constitutional Court can invalidate the Emir's dissolution. Executive power is executed by the government. The Emir appoints the prime minister, who in turn chooses the ministers comprising the government. According to the constitution, at least one minister has to be an elected MP from the parliament. The parliament is often rigorous in holding the government accountable, government ministers are frequently interpellated and forced to resign. Kuwait has more government accountability and transparency than other GCC countries. The judiciary is nominally independent of the executive and the legislature, and the Constitutional Court is charged with ruling on the conformity of laws and decrees with the constitution. The judiciary's independence has come under question, although the Constitutional Court is widely regarded as one of the most judicially independent courts in the Arab world. The Constitutional Court has the power to dissolve the parliament and invalidate the Emir's decrees, as happened in 2013 when the dissolved 2009 parliament resumed its role. Kuwaiti women outnumber men in the workforce. The political participation of Kuwaiti women has been limited, although Kuwaiti women are among the most emancipated women in the Middle East. In 2014 and 2015, Kuwait was ranked first among Arab countries in the Global Gender Gap Report. In 2013, 53% of Kuwaiti women participated in the labor force. Kuwait has higher female citizen participation in the workforce than other GCC countries. Political groups and parliamentary voting blocs exist, although most candidates run as independents. Once elected, many deputies form voting blocs in the National Assembly. Kuwaiti law does not recognize political parties. However, numerous political groups function as de facto political parties in elections, and there are blocs in the parliament. Major de facto political parties include the National Democratic Alliance, Popular Action Bloc, Hadas (Kuwaiti Muslim Brotherhood), National Islamic Alliance and the Justice and Peace Alliance. Kuwait follows the "civil law system" modeled after the French legal system, Kuwait's legal system is largely secular. Sharia law governs only family law for Muslim residents, while non-Muslims in Kuwait have a secular family law. For the application of family law, there are three separate court sections: Sunni, Shia, and non-Muslim. According to the United Nations, Kuwait's legal system is a mix of English common law, French civil law, Egyptian civil law and Islamic law. The court system in Kuwait is secular. Unlike other Arab states of the Persian Gulf, Kuwait does not have Sharia courts. Sections of the civil court system administer family law. Kuwait has the most secular commercial law in the Gulf. The parliament criminalized alcohol consumption in 1983. Kuwait's Code of Personal Status was promulgated in 1984. Human rights in Kuwait has been the subject of criticism, particularly regarding foreign workers' rights. Expatriates account for 70% of Kuwait's total population. The kafala system leaves foreign workers prone to exploitation. Kuwait has the most liberal labor laws in the GCC. As a result, the International Labour Organization (ILO) removed Kuwait from the list of countries violating workers rights. Male homosexuality is illegal in Kuwait and punishable by up to 6 years in prison. Kuwaiti activist and blogger Hamad al-Naqi, who is a Kuwaiti Shi'ite, was sentenced to 10 years in prison for "blasphemous tweets" and criticizing neighboring Saudi and Bahraini monarchs. Amnesty International designated al-Naqi a prisoner of conscience and called for his immediate and unconditional release. Before the Gulf War, Kuwait was the only "pro-Soviet" state in the Persian Gulf region. 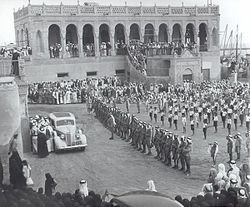 Kuwait acted as a conduit for the Soviets to the other Arab states of the Persian Gulf, and Kuwait was used to demonstrate the benefits of a pro-Soviet stance. In July 1987, Kuwait refused to allow U.S. military bases in its territory. As a result of the Gulf War, Kuwait's relations with the U.S. have improved (Major non-NATO ally) and currently hosts thousands of US military personnel and contractors within active U.S. facilities. Kuwait is also a major ally of ASEAN, while enjoying good relationship with China, establishing cooperation model in numerous fields. 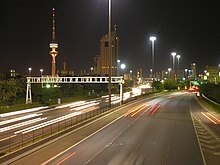 According to Kuwaiti officials, Kuwait is the largest Arab investor in Germany, especially in the Mercedes-Benz company. The Military of Kuwait consists of several joint defense forces. The governing bodies are the Kuwait Ministry of Defense, the Kuwait Ministry of Interior, the Kuwait National Guard and the Kuwait Fire Service Directorate. The Emir of Kuwait is the commander-in-chief of all defense forces by default. Even in the most adverse of all times such as a war, even the military is not allowed to make a single move without the Emir's consent. A satellite image of Kuwait reveals its desert topography. Kuwait shares land borders with Iraq and Saudi Arabia, and maritime borders with Iraq, Saudi Arabia, and Iran. Located in the north-east corner of the Arabian Peninsula, Kuwait is one of the smallest countries in the world in terms of land area. Kuwait lies between latitudes 28° and 31° N, and longitudes 46° and 49° E. The flat, sandy Arabian Desert covers most of Kuwait. Kuwait is generally low lying, with the highest point being 306 m (1,004 ft) above sea level. 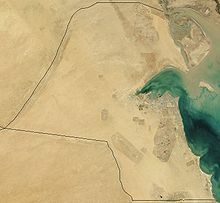 Kuwait has nine islands, all of which, with the exception of Failaka Island, are uninhabited. With an area of 860 km2 (330 sq mi), the Bubiyan is the largest island in Kuwait and is connected to the rest of the country by a 2,380-metre-long (7,808 ft) bridge. 0.6% of Kuwaiti land area is considered arable with sparse vegetation found along its 499-kilometre-long (310 mi) coastline. Kuwait City is located on Kuwait Bay, a natural deep-water harbor. Kuwait's Burgan field has a total capacity of approximately 70 billion barrels (1.1×1010 m3) of proven oil reserves. During the 1991 Kuwaiti oil fires, more than 500 oil lakes were created covering a combined surface area of about 35.7 km2 (13.8 sq mi). The resulting soil contamination due to oil and soot accumulation had made eastern and south-eastern parts of Kuwait uninhabitable. Sand and oil residue had reduced large parts of the Kuwaiti desert to semi-asphalt surfaces. The oil spills during the Gulf War also drastically affected Kuwait's marine resources. The spring season in March is warm with occasional thunderstorms. The frequent winds from the northwest are cold in winter and hot in summer. Southeasterly damp winds spring up between July and October. Hot and dry south winds prevail in spring and early summer. The shamal, a northwesterly wind common during June and July, causes dramatic sandstorms. Summers in Kuwait are some of the hottest on earth (like Ahvaz). The highest recorded temperature was 53.6 °C (128.5 °F), which is the highest temperature recorded in Asia. Kuwait experiences colder winters than other GCC countries because of its location in a northern position near Iraq and Iran. In 2014 Kuwait was the third country in the world in term of CO2 per capita emissions after Qatar and Trinidad and Tobago according to the World Bank. On average, every single inhabitant released that year 25.2 metric tons of CO2 in the atmosphere. In comparison, the world average was 5.0 tons per capita the same year. At present, there are five protected areas in Kuwait recognized by the IUCN. In response to Kuwait becoming the 169th signatory of the Ramsar Convention, Bubyan island's Mubarak al-Kabeer reserve was designated as the country's first Wetland of International Importance. The 50,948 ha reserve consists of small lagoons and shallow salt marshes and is important as a stop-over for migrating birds on two migration routes. The reserve is home to the world's largest breeding colony of crab-plover. More than 363 species of birds were recorded in Kuwait, 18 species of which breed in the country. Kuwait is situated at the crossroads of several major bird migration routes and between two and three million birds pass each year. The marshes in northern Kuwait and Jahra have become increasingly important as a refuge for passage migrants. Kuwaiti islands are important breeding areas for four species of tern and the socotra cormorant. Kuwait's marine and littoral ecosystems contain the bulk of the country's biodiversity heritage. Twenty eight species of mammal are found in Kuwait; animals such as gerboa, desert rabbits and hedgehogs are common in the desert. Large carnivores, such as the wolf, caracal and jackal, are not found. Among the endangered mammalian species are the red fox and wild cat. Causes for wildlife extinction are habitat destruction and extensive unregulated hunting. Forty reptile species have been recorded although none are endemic to Kuwait. Kuwait does not have any permanent rivers. It does have some wadis, the most notable of which is Wadi Al-Batin which forms the border between Kuwait and Iraq. Kuwait relies on water desalination as a primary source of fresh water for drinking and domestic purposes. There are currently more than six desalination plants. Kuwait was the first country in the world to use desalination to supply water for large-scale domestic use. The history of desalination in Kuwait dates back to 1951 when the first distillation plant was commissioned. In 1965, the Kuwaiti government commissioned the Swedish engineering company of VBB (Sweco) to develop and implement a plan for a modern water-supply system for Kuwait City. The company built five groups of water towers, thirty-one towers total, designed by its chief architect Sune Lindström, called "the mushroom towers". For a sixth site, the Emir of Kuwait, Sheikh Jaber Al-Ahmed, wanted a more spectacular design. This last group, known as Kuwait Towers, consists of three towers, two of which also serve as water towers. Water from the desalination facility is pumped up to the tower. The thirty-three towers have a standard capacity of 102,000 cubic meters of water. "The Water Towers" (Kuwait Tower and the Kuwait Water Towers) were awarded the Aga Khan Award for Architecture (1980 Cycle). Kuwait's fresh water resources are limited to groundwater, desalinated seawater, and treated wastewater effluents. There are three major municipal wastewater treatment plants. Most water demand is currently satisfied through seawater desalination plants. Sewage disposal is handled by a national sewage network that covers 98% of facilities in the country. Kuwait has a petroleum-based economy, petroleum is the main export product. The Kuwaiti dinar is the highest-valued unit of currency in the world. According to the World Bank, Kuwait is the seventh richest country in the world per capita. Kuwait is the second richest GCC country per capita (after Qatar). Petroleum accounts for half of GDP and 90% of government income. Non-petroleum industries include financial services. In the past five years, there has been a significant rise in entrepreneurship and small business start-ups in Kuwait. The informal sector is also on the rise, mainly due to the popularity of Instagram businesses. Kuwait is a major source of foreign economic assistance to other states through the Kuwait Fund for Arab Economic Development, an autonomous state institution created in 1961 on the pattern of international development agencies. In 1974, the fund's lending mandate was expanded to include all developing countries in the world. In 2018 Kuwait enacted certain measures to regulate foreign labor. Citing security concerns, workers from Georgia will be subject to heightened scrutiny when applying for entry visas, and an outright ban was being imposed on the entry of domestic workers from Guinea-Bissau and Vietnam. Workers from Bangladesh are also banned. Despite its relatively small territory, Kuwait has proven crude oil reserves of 104 billion barrels, estimated to be 10% of the world's reserves. According to the constitution, all natural resources in the country are state property. Kuwait currently pumps 2.9 million bpd and its full production capacity is a little over 3 million bpd. The Kuwait Investment Authority (KIA) is Kuwait's sovereign wealth fund specializing in foreign investment. The KIA is the world's oldest sovereign wealth fund. Since 1953, the Kuwaiti government has directed investments into Europe, United States and Asia Pacific. As of 2015[update], the holdings were valued at $592 billion in assets. It is the 5th largest sovereign wealth fund in the world. Kuwait has a leading position in the financial industry in the GCC; the abyss that separates Kuwait from its Persian Gulf neighbors in terms of tourism, transport, and other measures of diversification is absent in the financial sector. The Emir has promoted the idea that Kuwait should focus its energies, in terms of economic development, on the financial industry. The historical preeminence of Kuwait (among the Persian Gulf monarchies) in finance dates back to the founding of the National Bank of Kuwait in 1952. The bank was the first local publicly traded corporation in the Persian Gulf region. In the late 1970s and early 1980s, an alternative stock market, trading in shares of Persian Gulf companies, emerged in Kuwait, the Souk Al-Manakh. At its peak, its market capitalization was the third highest in the world, behind only the US and Japan, and ahead of the UK and France. Kuwait has a large wealth-management industry that stands out in the region. Kuwaiti investment companies administer more assets than those of any other GCC country, save the much larger Saudi Arabia. The Kuwait Financial Centre, in a rough calculation, estimated that Kuwaiti firms accounted for over one-third of the total assets under management in the GCC. The relative strength of Kuwait in the financial industry extends to its stock market. For many years, the total valuation of all companies listed on the Kuwait Stock Exchange far exceeded the value of those on any other GCC bourse, except Saudi Arabia. In 2011, financial and banking companies made up more than half of the market capitalization of the Kuwaiti bourse; among all the Persian Gulf states, the market capitalization of Kuwaiti financial-sector firms was, in total, behind only that of Saudi Arabia. In recent years, Kuwaiti investment companies have invested large percentages of their assets abroad, and their foreign assets have become substantially larger than their domestic assets. Kuwait has a state-funded healthcare system, which provides treatment without charge to Kuwaiti nationals. There are outpatient clinics in every residential area in Kuwait. A public insurance scheme exists to provide reduced cost healthcare to expatriates. Private healthcare providers also run medical facilities in the country, available to members of their insurance schemes. There are 29 public hospitals. Many new hospitals are under construction. The Sheikh Jaber Al-Ahmad Hospital is the largest hospital in the Middle East. Kuwait has a growing scientific research sector. To date, Kuwait has registered 384 patents, the second highest figure in the Arab world. Kuwait produces the largest number of patents per capita in the Arab world and OIC. The government has implemented various programs to foster innovation resulting in patent rights. Between 2010 and 2016, Kuwait registered the highest growth in patents in the Arab world. Kuwait has the highest literacy rate in the Arab world. The general education system consists of four levels: kindergarten (lasting for 2 years), primary (lasting for 5 years), intermediate (lasting for 4 years) and secondary (lasting for 3 years). Schooling at primary and intermediate level is compulsory for all students aged 6 – 14. All the levels of state education, including higher education, are free. The public school system is undergoing a revamp due to a project in conjunction with the World Bank. In 2013, the government launched a pilot project in 48 schools across the state called the National Curriculum Framework. The curriculum is set to be implemented in the next two or three years. Tourism accounts for 1.5 percent of the GDP. In 2016, the tourism industry generated nearly $500 million in revenue. The annual "Hala Febrayer" festival attracts many tourists from neighboring GCC countries, and includes a variety of events including music concerts, parades, and carnivals. The festival is a month-long commemoration of the liberation of Kuwait, and runs from 1 to 28 February. Liberation Day itself is celebrated on 26 February. Kuwait has an extensive and modern network of highways. Roadways extended 5,749 km (3,572 mi), of which 4,887 km (3,037 mi) is paved. There are more than two million passenger cars, and 500,000 commercial taxis, buses, and trucks in use. On major highways the maximum speed is 120 km/h (75 mph). Since there is no railway system in the country, most people travel by automobiles. The country's public transportation network consists almost entirely of bus routes. The state owned Kuwait Public Transportation Company was established in 1962. It runs local bus routes across Kuwait as well as longer distance services to other Gulf states. The main private bus company is CityBus, which operates about 20 routes across the country. Another private bus company, Kuwait Gulf Link Public Transport Services, was started in 2006. It runs local bus routes across Kuwait and longer distance services to neighbouring Arab countries. There are two airports in Kuwait. Kuwait International Airport serves as the principal hub for international air travel. State-owned Kuwait Airways is the largest airline in the country. A portion of the airport complex is designated as Al Mubarak Air Base, which contains the headquarters of the Kuwait Air Force, as well as the Kuwait Air Force Museum. In 2004, the first private airline of Kuwait, Jazeera Airways, was launched. In 2005, the second private airline, Wataniya Airways was founded. Kuwait has one of the largest shipping industries in the region. The Kuwait Ports Public Authority manages and operates ports across Kuwait. The country's principal commercial seaports are Shuwaikh and Shuaiba, which handled combined cargo of 753,334 TEU in 2006. Mina Al-Ahmadi, the largest port in the country, handles most of Kuwait's oil exports. Construction of another major port located in Bubiyan island started in 2007. The port is expected to handle 1.3 million TEU when operations start. Kuwait's 2018 population was 4.6 million people, of which 1.4 million were Kuwaitis, 1.2 million are other Arabs, 1.8 million Asian expatriates, and 47,227 Africans. Expatriates in Kuwait account for around 70% of Kuwait's total population. In end of december 2018, 57.65% of Kuwait's total population are Arabs (including Arab expats). Indians and Egyptians are the largest expat communities respectively. Kuwaiti society is diverse and tolerant. Most Kuwaiti citizens are Muslim; it is estimated that 60%–65% are Sunni and 35%–40% are Shias. Most Shia Kuwaiti citizens are of Persian ancestry. The country includes a native Christian community, estimated to be composed of between 259 and 400 Christian Kuwaiti citizens. Kuwait is the only GCC country besides Bahrain to have a local Christian population who hold citizenship. There is also a small number of Bahá'í Kuwaiti citizens. Kuwait also has a large community of expatriate Christians, Hindus, Buddhists, and Sikhs. – Christianity from Asia in Kuwait mostly came from the Philippines, South Korea, and some from Indonesia, Malaysia, India and other country. – Islam from Asia in Kuwait mostly came from Indonesia, Malaysia, Kazakhstan, Kirgyztan and other country. Kuwait's official language is Modern Standard Arabic, but its everyday usage is limited to journalism and education. Kuwaiti Arabic is the variant of Arabic used in everyday life. English is widely understood and often used as a business language. Beside English, French is taught as a third language for the students of the humanities at schools, but for two years only. Kuwaiti Arabic is a variant of Gulf Arabic, sharing similarities with the dialects of neighboring coastal areas in Eastern Arabia. Due to immigration during its early history as well as trade, Kuwaiti Arabic borrowed a lot of words from Persian, Indian languages, Turkish, English and Italian. Due to historical immigration, Kuwaiti Persian is used among Ajam Kuwaitis. The Iranian sub-dialects of Larestani, Khonji, Bastaki and Gerashi also influenced the vocabulary of Kuwaiti Arabic. ^ a b c d e f "Nationality by Religion in Kuwait 2018". Statistic PACI. Retrieved 4 February 2019. ^ a b c d "Kuwait". The World Factbook. Central Intelligence Agency. 10 April 2015. Archived from the original on 2 July 2014. ^ "Population of Kuwait". Kuwait Government Online. 2013. Archived from the original on 17 January 2013. ^ a b c d "IMF Report for Selected Countries and Subjects : Kuwait". International Monetary Fund. Archived from the original on 24 February 2018. Retrieved 1 April 2017. ^ "Kuwait – definition of Kuwait in English". Oxford Dictionaries. Archived from the original on 22 August 2017. Retrieved 5 May 2017. ^ "Definition of Kuwait by Merriam-Webster". Merriam-Webster. Archived from the original on 1 May 2017. Retrieved 5 May 2017. ^ "Public Authority for Civil Information". Government of Kuwait. 2015. Retrieved 12 March 2016. ^ "Kuwait steps up deportations of expat workers". The National. 29 April 2016. Archived from the original on 28 June 2016. ^ Associated Press. "U.S. tightens military relationship with Kuwait". nl.newsbank.com. Retrieved 23 May 2018. ^ a b Times, Global. "KUNA : Kuwait calls for stronger GCC-ASEAN partnership – Politics – 28/09/2017". www.kuna.net.kw. ^ a b "KUNA : Kuwait calls for stronger GCC-ASEAN partnership – Politics – 28/09/2017". www.kuna.net.kw. ^ a b "China and Kuwait agree to establish strategic partnership". GBTIMES. ^ "Kuwait". Reporters without Borders. Archived from the original on 13 July 2016. Retrieved 12 March 2016. ^ a b "Kuwait's Democracy Faces Turbulence". Wall Street Journal. Archived from the original on 26 June 2016. Retrieved 12 March 2016. ^ a b c d "Current Members – Global Cultural Districts Network". Global Cultural Districts Network. ^ a b c d Al-Nakib, Farah. Kuwait Transformed: A History of Oil and Urban Life. Stanford University Press. ISBN 9780804798525. ^ a b Casey, Michael. The history of Kuwait - Greenwood histories of modern nations. Greenwood. ISBN 0313340730. ^ Al-Jassar, Mohammad Khalid A. (May 2009). Constancy and Change in Contemporary Kuwait City: The Socio-cultural Dimensions of the Kuwait Courtyard and Diwaniyya (PhD thesis). The University of Wisconsin-Milwaukee. p. 64. ISBN 978-1-109-22934-9. ^ Bell, Gawain, Sir (1983). Shadows on the Sand: The Memoirs of Sir Gawain Bell. p. 222. ISBN 978-0-905838-92-2. Archived from the original on 12 April 2016. ^ "ʻAlam-i Nisvāṉ". 2 (1–2). University of Karachi. 1995: 18. Archived from the original on 24 February 2018. Kuwait became an important trading port for import and export of goods from India, Africa and Arabia. ^ a b Bennis, Phyllis; Moushabeck, Michel, eds. (1991). Beyond the Storm: A Gulf Crisis Reader. Brooklyn, New York: Olive Branch Press. p. 42. ISBN 978-0-940793-82-8. ^ Lauterpacht, Elihu; Greenwood, C. J.; Weller, Marc (1991). The Kuwait Crisis: Basic Documents. Cambridge international documents series, Issue 1. Cambridge, UK: Research Centre for International Law, Cambridge University Press. p. 4. ISBN 978-0-521-46308-9. ^ Abdullah, Thabit A. J. (2001). Merchants, Mamluks, and Murder: The Political Economy of Trade in Eighteenth-Century Basra. Albany, New York: State University of New York Press. p. 72. ISBN 978-0-7914-4807-6. ^ Sagher, Mostafa Ahmed. The impact of economic activities on the social and political structures of Kuwait (1896–1946) (PDF) (PhD). Durham, UK: Durham University. p. 108. Archived (PDF) from the original on 4 March 2016. Retrieved 12 March 2016. ^ Nijhoff, M. (1974). Bijdragen tot de taal-, land- en volkenkunde (in Dutch). Volume 130. Leiden, Netherlands: Koninklijk Instituut voor Taal-, Land- en Volkenkunde. p. 111. ^ Hasan, Mohibbul, ed. (2007) [First published 1968]. Waqai-i manazil-i Rum: Tipu Sultan's mission to Constantinople. Delhi, India: Aakar Books. p. 18. ISBN 9788187879565. For owing to Basra's misfortunes, Kuwait and Zubarah became rich. ^ Fattah, Hala Mundhir (1997). The Politics of Regional Trade in Iraq, Arabia, and the Gulf, 1745–1900. Albany, New York: State University of New York Press. p. 114. ISBN 978-0-7914-3113-9. ^ Agius, Dionisius A. (2012). Seafaring in the Arabian Gulf and Oman: People of the Dhow. New York: Routledge. p. 48. ISBN 978-1-136-20182-0. ^ Ágoston, Gábor; Masters, Bruce (2009). Encyclopedia of the Ottoman Empire. New York: Infobase Publishing. p. 321. ISBN 978-1-4381-1025-7. ^ a b c d e Al-Jassar, Mohammad Khalid A. (May 2009). Constancy and Change in Contemporary Kuwait City: The Socio-cultural Dimensions of the Kuwait Courtyard and Diwaniyya (PhD thesis). The University of Wisconsin-Milwaukee. p. 80. ^ a b c d e Casey, Michael S. (2007). The History of Kuwait. Westport, Connecticut: Greenwood Publishing Group. p. 57. ISBN 978-0-313-34073-4. ^ LSE and Michael Herb. March 2016. "The origins of Kuwait's National Assembly". [url=http://eprints.lse.ac.uk/65693/1/39_MichaelHerb.pdf]. ^ a b c Al Sager, Noura, ed. (2014). Acquiring Modernity: Kuwait's Modern Era Between Memory and Forgetting. National Council for Culture, Arts and Letters. p. 7. ISBN 9789990604238. ^ a b Al-Nakib, Farah (2014). Al-Nakib, Farah, ed. "Kuwait's Modernity Between Memory and Forgetting". Academia.edu: 7. Archived from the original on 6 August 2017. ^ a b Farid, Alia (2014). "Acquiring Modernity: Kuwait at the 14th International Architecture Exhibition". aliafarid.net. Archived from the original on 30 October 2016. ^ Gonzales, Desi (November–December 2014). "Acquiring Modernity: Kuwait at the 14th International Architecture Exhibition". Art Papers. Archived from the original on 24 December 2014. Retrieved 21 February 2015. ^ Tsourapas, Gerasimos (2 July 2016). "Nasser's Educators and Agitators across al-Watan al-'Arabi: Tracing the Foreign Policy Importance of Egyptian Regional Migration, 1952–1967". British Journal of Middle Eastern Studies. 43 (3): 324–341. doi:10.1080/13530194.2015.1102708. ISSN 1353-0194. ^ Bourisly, Nibal K.; Al-hajji, Maher N. (2004). "Kuwait's National Day: Four Decades of Transformed Celebrations". In Fuller, Linda K. National Days/national Ways: Historical, Political, and Religious Celebrations Around the World. Greenwood Publishing Group. pp. 125–126. ISBN 9780275972707. Archived from the original on 14 February 2017. Retrieved 23 February 2018. ^ "Looking for Origins of Arab Modernism in Kuwait". Hyperallergic. Archived from the original on 11 July 2015. ^ Al-Nakib, Farah (1 March 2014). "Towards an Urban Alternative for Kuwait: Protests and Public Participation". Built Environment. 40 (1): 101–117. doi:10.2148/benv.40.1.101. Archived from the original on 6 August 2017. ^ a b c d "Cultural developments in Kuwait". March 2013. Archived from the original on 24 February 2018. ^ Chee Kong, Sam (1 March 2014). "What Can Nations Learn from Norway and Kuwait in Managing Sovereign Wealth Funds". Market Oracle. Archived from the original on 13 September 2014. ^ al-Nakib, Farah (17 September 2014). "Understanding Modernity: A Review of the Kuwait Pavilion at the Venice Biennale". Jadaliyya. Archived from the original on 29 November 2014. ^ a b Sajjad, Valiya S. "Kuwait Literary Scene A Little Complex". Arab Times. Archived from the original on 29 November 2014. A magazine, Al Arabi, was published in 1958 in Kuwait. It was the most popular magazine in the Arab world. It came out it in all the Arabic countries, and about a quarter million copies were published every month. ^ Gunter, Barrie; Dickinson, Roger, eds. (2013). News Media in the Arab World: A Study of 10 Arab and Muslim Countries. New York: Bloomsbury Publishing USA. p. 24. ISBN 978-1-4411-0239-3. ^ Sager, Abdulaziz; Koch, Christian; Tawfiq Ibrahim, Hasanain, eds. (2008). Gulf Yearbook 2006–2007. I. B. Tauris. p. 39. The Kuwaiti press has always enjoyed a level of freedom unparalleled in any other Arab country. ^ Muslim Education Quarterly. 8. Islamic Academy. 1990. p. 61. Kuwait is a primary example of a Muslim society which embraced liberal and Western attitudes throughout the sixties and seventies. ^ Rubin, Barry, ed. (2010). Guide to Islamist Movements. Volume 1. Armonk, New York: M.E. Sharpe. p. 306. ISBN 978-0-7656-4138-0. ^ Wheeler, Deborah L. (2006). The Internet in the Middle East: Global Expectations And Local Imaginations. Albany, New York: State University of New York Press. p. 99. ISBN 978-0-7914-6586-8. ^ a b c "Kuwait unveils $775M Sheikh Jaber Al Ahmad Cultural Centre". 7 December 2016. Archived from the original on 27 December 2016. ^ "Kuwait's Souk al-Manakh Stock Bubble". Stock-market-crash.net. 23 June 2012. Archived from the original on 19 May 2012. Retrieved 14 January 2013. ^ Bansal, Narottam P.; Singh, Jitendra P.; Ko, Song; Castro, Ricardo; Pickrell, Gary; Manjooran, Navin Jose; Nair, Mani; Singh, Gurpreet, eds. (1 July 2013). Processing and Properties of Advanced Ceramics and Composites. 240. Hoboken, New Jersey: John Wiley & Sons. p. 205. ISBN 978-1-118-74411-6. ^ "Iraqi Invasion of Kuwait; 1990". Acig.org. Archived from the original on 6 October 2014. Retrieved 28 June 2010. ^ a b Gregory, Derek (2004). The Colonial Present: Afghanistan, Palestine, Iraq. Wiley-Blackwell. ISBN 978-1-57718-090-6. Retrieved 28 June 2010. ^ "Iraq and Kuwait: 1972, 1990, 1991, 1997". Earthshots: Satellite Images of Environmental Change. Archived from the original on 29 April 2012. Retrieved 14 January 2013. ^ "Iraq and Kuwait Discuss Fate of 600 Missing Since Gulf War". Los Angeles Times. Associated Press. 9 January 2003. Archived from the original on 6 October 2014. ^ "Kuwait ranks top among Arab states in human development – UNDP report". KUNA. 2009. Archived from the original on 12 August 2016. ^ "Human Development Index 2009" (PDF). Human Development Report. hdr.undp.org. p. 143. Archived (PDF) from the original on 13 May 2014. ^ "Human Development Index 2007/2008" (PDF). Human Development Report. p. 233. Archived (PDF) from the original on 15 April 2014. ^ "Human Development Index 2006" (PDF). Human Development Report. p. 283. Archived (PDF) from the original on 10 March 2016. ^ a b "Kuwait highest in closing gender gap: WEF". Archived from the original on 12 August 2016. ^ a b "The Global Gender Gap Index 2014 – World Economic Forum". World Economic Forum. Archived from the original on 14 April 2017. ^ a b "Global Gender Gap Index Results in 2015". World Economic Forum. Archived from the original on 5 June 2016. ^ "Sea City achieves the impossible". The Worldfolio. March 2016. Archived from the original on 20 December 2016. ^ "Tamdeen Group's US$700 million Al Khiran development to bolster Kuwait's retail and tourism growth". Tamdeen Group. Archived from the original on 20 December 2016. ^ a b c d e f "Kuwait National Cultural District Museums Director" (PDF). 28 August 2017. Archived (PDF) from the original on 25 January 2018. ^ a b c "Kuwait National Cultural District". Archived from the original on 29 August 2017. ^ "Opening of the Sheikh Jaber Al Ahmad Cultural Centre a milestone in the illustrious company's history". 7 December 2016. Archived from the original on 27 December 2016. ^ a b "أمير الكويت يدشن أكبر مركز ثقافي في الشرق الأوسط.. و4 جواهر تضيء شاطئ الخليج". Oman Daily (in Arabic). Archived from the original on 29 August 2017. ^ "UK Trade & Investment" (PDF). UK Trade & Investment. June 2016. p. 3. Archived (PDF) from the original on 21 December 2016. ^ Clive Holes (2004). Modern Arabic: Structures, Functions, and Varieties. Georgetown University Press. p. 75. ISBN 978-1-58901-022-2. Archived from the original on 11 October 2017. ^ Zubir, S.S.; Brebbia, C.A., eds. (2014). The Sustainable City VIII (2 Volume Set): Urban Regeneration and Sustainability. Volume 179 of WIT Transactions on Ecology and the Environment. Ashurst, Southampton, UK: WIT Press. p. 599. ISBN 978-1-84564-746-9. ^ Alazemi, Einas. The role of fashion design in the construct of national identity of Kuwaiti women in the 21st century (PhD). University of Southampton. p. 140-199. Archived from the original on 22 August 2017. ^ Al Sager, Noura, ed. (2014). Acquiring Modernity: Kuwait's Modern Era Between Memory and Forgetting. National Council for Culture, Arts and Letters. p. 7. ISBN 9789990604238. ^ "The Situation of Women in the Gulf States" (PDF). p. 18. Archived (PDF) from the original on 6 June 2017. ^ Karen E. Young. "Small Victories for GCC Women: More Educated, More Unemployed". The Arab Gulf States Institute. Archived from the original on 17 June 2017. ^ Karen E. Young. "More Educated, Less Employed: The Paradox of Women's Employment in the Gulf" (PDF). pp. 7–8. Archived (PDF) from the original on 22 August 2017. ^ a b c "Kuwait leads Gulf states in women in workforce". Gulf News. Archived from the original on 14 May 2016. ^ Stephenson, Lindsey. "Women and the Malleability of the Kuwaiti Diwaniyya". p. 190. Archived from the original on 6 August 2017. ^ a b Al Mukrashi, Fahad (22 August 2015). "Omanis turn their backs on local dramas". Gulf News. Archived from the original on 25 April 2016. Kuwait's drama industry tops other Gulf drama as it has very prominent actors and actresses, enough scripts and budgets, produces fifteen serials annually at least. ^ a b c Hammond, Andrew, ed. (2017). Pop Culture in North Africa and the Middle East: Entertainment and Society Around the World. California: ABC-CLIO. pp. 143–144. ISBN 9781440833847. ^ "Big plans for small screens". BroadcastPro Me. Archived from the original on 23 April 2016. Around 90% of Khaleeji productions take place in Kuwait. ^ Papavassilopoulos, Constantinos (10 April 2014). "OSN targets new markets by enriching its Arabic content offering". IHS Inc. Archived from the original on 22 April 2016. ^ Fattahova, Nawara (26 March 2015). "First Kuwaiti horror movie to be set in 'haunted' palace". Kuwait Times. Archived from the original on 18 May 2015. Kuwait's TV soaps and theatrical plays are among the best in the region and second most popular after Egypt in the Middle East. ^ Bjørn T. Asheim. "An Innovation driven Economic Diversification Strategy for Kuwait" (PDF). Kuwait Foundation for the Advancement of Sciences. p. 9. Archived (PDF) from the original on 10 July 2017. ^ "Kuwaiti Drama Museum: formulating thoughts of the Gulf". 23 May 2014. Archived from the original on 27 April 2016. ^ Mansfield, Peter (1990). Kuwait: vanguard of the Gulf. Hutchinson. p. 113. Archived from the original on 16 April 2017. ^ "Kuwait Cultural Days kick off in Seoul". Kuwait News Agency (in Arabic). 18 December 2015. Archived from the original on 13 July 2016. ^ a b Hammond, Andrew (2007). Popular Culture in the Arab World: Arts, Politics, and the Media. Cario, Egypt: American University in Cairo Press. p. 277. ISBN 9789774160547. ^ Cavendish, Marshall (2006). World and Its Peoples, Volume 1. Singapore: Marshall Cavendish. p. 244. ISBN 978-0-7614-7571-2. Archived from the original on 2 January 2017. ^ Watson, Katie (18 December 2010). "Reviving Kuwait's theatre industry". BBC News. Archived from the original on 11 November 2014. ^ a b Herbert, Ian; Leclercq, Nicole, eds. (2000). "An Account of the Theatre Seasons 1996–97, 1997–98 and 1998–99". The World of Theatre (2000 ed.). London: Taylor & Francis. p. 147. ISBN 978-0-415-23866-3. ^ Rubin, Don, ed. (1999). "Kuwait". The World Encyclopedia of Contemporary Theatre. Volume 4: The Arab world. London: Taylor & Francis. p. 143. ISBN 978-0-415-05932-9. ^ Alhajri, Khalifah Rashed. A Scenographer's Perspective on Arabic Theatre and Arab-Muslim Identity (PDF) (PhD). Leeds, UK: University of Leeds. p. 207. Archived (PDF) from the original on 4 March 2017. ^ a b "Shooting the Past". y-oman.com. 11 July 2013. Archived from the original on 5 May 2016. Most Omanis who get to study drama abroad tend to go to Kuwait or Egypt. In the Persian Gulf, Kuwait has long been a pioneer in theatre, film and television since the establishment of its Higher Institute of Dramatic Arts (HIDA) in 1973. By contrast, there is no drama college or film school in Oman, although there is a drama course at Sultan Qaboos University. ^ Herbert, Ian; Leclercq, Nicole, eds. (2003). "World of Theatre 2003 Edition: An Account of the World's Theatre Seasons". The World of Theatre (2003 ed.). London: Taylor & Francis. p. 214. ISBN 9781134402120. ^ Fiona MacLeod. "The London musician who found harmony in Kuwait". Financial Times. Archived from the original on 9 April 2017. ^ a b Bloom, Jonathan; Sheila, Blair, eds. (2009). Grove Encyclopedia of Islamic Art & Architecture: Three-Volume Set (2009 ed.). London: Oxford University Press. p. 405. ISBN 978-0-19-530991-1. Archived from the original on 30 April 2016. ^ Zuhur, Sherifa, ed. (2001). Colors of Enchantment: Theater, Dance, Music, and the Visual Arts of the Middle East (2001 ed.). New York: American University in Cairo Press. p. 383. ISBN 9781617974809. ^ Bjørn T. Asheim. "An Innovation driven Economic Diversification Strategy for Kuwait" (PDF). Kuwait Foundation for the Advancement of Sciences. pp. 49–50. Archived (PDF) from the original on 10 July 2017. ^ Al Qassemi, Sultan Sooud (22 November 2013). "Correcting misconceptions of the Gulf's modern art movement". Al-Monitor: The Pulse of the Middle East. Archived from the original on 29 November 2014. ^ "Kuwait". Atelier Voyage. Archived from the original on 29 November 2014. ^ Kristine Khouri. "Mapping Arab Art through the Sultan Gallery". ArteEast. Archived from the original on 11 October 2016. ^ "The Sultan Gallery – Kristine Khouri". Archived from the original on 18 January 2016. ^ "Culture of Kuwait". Kuwait Embassy in Austria. Archived from the original on 2 April 2017. ^ "Art Galleries and Art Museums in Kuwait". Art Kuwait. Archived from the original on 3 May 2017. ^ "Egyptian Artist Fatma, talks about the gateway to human faces and equality for all". Reconnecting Arts. Archived from the original on 22 August 2017. ^ "Kuwaiti Artist Rua AlShaheen tells us about recycling existing elements to tell a new narrative". Reconnecting Arts. Archived from the original on 5 April 2017. ^ "Farah Behbehani & the Story of the letter Haa '". Al Ostoura Magazine. Archived from the original on 22 August 2017. ^ Muayad H., Hussain (2012). Modern Art from Kuwait: Khalifa Qattan and Circulism (PDF) (PhD thesis). University of Birmingham. Archived (PDF) from the original on 11 October 2016. ^ "Khalifa Qattan, Founder of Circulism". Archived from the original on 29 November 2014. ^ "Interview with Ali Al-Youha – Secretary General of Kuwait National Council for Culture, Arts and Letters (NCCAL)" (PDF). oxgaps.org. Archived (PDF) from the original on 3 August 2017. ^ "Kuwait celebrates formative arts festival". Kuwait News Agency (KUNA). Archived from the original on 31 March 2017. ^ "KAA honors winners of His Highness Amir formative arts award". Kuwait News Agency (KUNA). Archived from the original on 31 March 2017. ^ a b "12th Kuwait International Biennial". AsiaArt archive. Archived from the original on 31 March 2017. ^ a b Rolf Killius. "The Cradle of Arabic Sawt Music: The Early Musician Generations in Kuwait". Qatar Digital Library. Archived from the original on 28 August 2017. ^ "Opportunity report for Dutch businesses in Gulf region – Creative Industries" (PDF). Government of Netherlands. p. 10. Archived (PDF) from the original on 20 September 2016. ^ "Kuwait's musical heritage: The heartbeat of a nation". Archived from the original on 4 September 2014. ^ Sophie Chamas. "Ya Bahr". Brownbook. ^ "The Innerworkings of Kuwaiti Pearl Diving: Ghazi AlMulaifi". Archived from the original on 6 June 2014. ^ Rolf Killius. "Hidden Treasures: Reflections on Traditional Music in Kuwait". Qatar Digital Library. Archived from the original on 23 March 2015. ^ a b Mustafa Said. "History of Recording in the Gulf area, Part 1". Archived from the original on 15 July 2016. Retrieved 12 March 2016. ^ a b Ulaby, Laith. Performing the Past: Sea Music in the Arab Gulf States (PDF) (PhD). University of California, Los Angeles. p. 99. ^ a b Mustafa Said. "History of Recording in the Gulf area, Part 2". Archived from the original on 27 May 2016. Retrieved 12 March 2016. ^ "A Gulfie record collector writes". ^ "Sheikh Jaber Al Ahmad Cultural Centre". jacc-kw.com. Archived from the original on 3 June 2017. ^ "International Music Festival opens in Kuwait" (PDF). Archived (PDF) from the original on 13 September 2016. ^ "Int'l Music Festival opens in Kuwait". Kuwait News Agency. Archived from the original on 11 September 2016. ^ a b c d Al-Faraj, Hamed. Kuwait music educators' perspectives regarding the general goals for music education in Kuwait (PhD). Case Western Reserve University. p. 23-26. Archived from the original on 26 August 2017. ^ a b c d Alderaiwaish, Ahmad. Teaching the Clarinet in Kuwait: Creating A Curriculum for the Public Authority for Applied Education and Training (PDF) (PhD). University of Southampton. p. 51-55. Archived (PDF) from the original on 25 August 2017. ^ a b c d Alyoser, Abdulaziz Z. Self-Reported Attitudes and Practices of Music Instructors in Kuwait regarding Adult Music Learners (PhD). Case Western Reserve University. p. 12. Archived from the original on 26 August 2017. ^ "Kuwait Literature". Fanack Chronicle. Retrieved 7 May 2015. ^ "Kuwaiti literature interacts with foreign literatures – study". KUNA. ^ Kuwait, Adrian Murphy Main Image: a rain forest at the Sheikh Abdullah Al Salam Cultural Centre in. "BECK – international museum fit-out: breaking the boundaries of what's possible". Museums + Heritage Advisor. ^ "Kuwait Cultural Centre" (PDF). ^ a b c Exell, Karen (2016). Modernity and the Museum in the Arabian Peninsula. Taylor & Francis. pp. 147–179. ISBN 9781317279006. Archived from the original on 16 April 2017. ^ "About Dar al-Athar al-Islamiyyah". darmuseum.org.kw. Archived from the original on 22 August 2017. ^ "Dar al-Athar al-Islamiyyah at Amricani Cultural Centre". darmuseum.org.kw. Archived from the original on 14 April 2017. ^ "Dar al-Athar al-Islamiyyah at Yarmouk Cultural Centre". darmuseum.org.kw. Archived from the original on 14 April 2017. ^ a b "Libraries – Dar al Athar al Islamiyyah". darmuseum.org.kw. Archived from the original on 14 April 2017. ^ "Abous Us – CAPKuwait". capkuwait.com. Archived from the original on 28 May 2017. ^ "First Art Library in Kuwait". artkuwait.org. Archived from the original on 22 February 2014. ^ "The Great Journey". Ibraaz. Archived from the original on 27 January 2018. ^ a b Excell, Karen; Wakefield, Sarina, eds. (2016). Museums in Arabia: Transnational Practices and Regional Processes. Taylor & Francis. pp. 137–158. ISBN 9781317092766. Archived from the original on 16 April 2017. ^ Exell, Karen (2016). Modernity and the Museum in the Arabian Peninsula. Taylor & Francis. p. 176. ISBN 9781317279006. Archived from the original on 16 April 2017. ^ "Kuwait Museum of Modern Art". myartguides.com. Archived from the original on 18 May 2017. ^ Gonzales, Desi (November–December 2014). "Acquiring Modernity: Kuwait at the 14th International Architecture Exhibition". Art Papers. Art Papers. Archived from the original on 24 December 2014. Retrieved 21 February 2015. ^ "Welcome, Georgia & Kuwait". International Ice Hockey Federation. 13 May 2009. Archived from the original on 28 December 2010. Retrieved 9 June 2009. ^ "Kuwait wins IIHF Ice Hockey Challenge Cup of Asia". 12 June 2015. Archived from the original on 4 February 2016. ^ "Kuwait top ice hockey Challenge Cup". 12 June 2015. Archived from the original on 4 February 2016. ^ "Freedom of the Press – Scores and Status Data 1980–2014". Freedom House. Archived from the original on 17 March 2016. Retrieved 12 March 2016. ^ "Press Freedom". Archived from the original on 27 September 2015. Since 2005, Kuwait has earned the highest ranking of all Arab countries on the annual Press Freedom Index of Reporters Without Borders. ^ a b "Kuwait Press Freedom". Archived from the original on 27 September 2015. ^ a b "Press Freedom Index 2011–2012". Archived from the original on 14 September 2016. ^ a b "Press Freedom Index 2013". Archived from the original on 14 September 2016. ^ a b "World Press Freedom Index 2014 – Reporters Without Borders". Archived from the original on 14 September 2016. ^ "Press Freedom Index 2006". Archived from the original on 14 September 2016. ^ "Press Freedom Index 2007". Archived from the original on 14 September 2016. ^ "Press Freedom Index 2008". Archived from the original on 14 September 2016. ^ a b "Press Freedom Index 2009". p. 2. Archived from the original on 14 September 2016. ^ "Press Freedom Index 2010". Archived from the original on 14 September 2016. ^ "Operation Roll Back Kuwaiti Freedom". Human Rights Watch. Archived from the original on 3 January 2015. ^ "Freedom of the Press 2010" (PDF). p. 25. Archived (PDF) from the original on 11 October 2016. ^ "Freedom of the Press 2009" (PDF). p. 20. Archived (PDF) from the original on 27 December 2016. ^ "Freedom of the Press 2008" (PDF). p. 24. Archived (PDF) from the original on 11 October 2016. ^ "Freedom of the Press 2006" (PDF). p. 15. Archived (PDF) from the original on 30 December 2014. ^ "Freedom of the Press 2007" (PDF). p. 21. Archived (PDF) from the original on 11 October 2016. ^ "Freedom of the Press 2005" (PDF). p. 15. Archived (PDF) from the original on 30 December 2014. ^ Naomi Sakr (2004). Women and Media in the Middle East: Power Through Self-Expression. I.B.Tauris. p. 122. ISBN 978-1-85043-545-7. Archived from the original on 19 February 2016. ^ Ali Darwish (2009). Social Semiotics of Arabic Satellite Television: Beyond the Glamour. Writescope Publishers. p. 120. ISBN 978-0-9757419-8-6. Archived from the original on 29 May 2016. ^ Selvik, Kjetil (2011). "Elite Rivalry in a Semi-Democracy: The Kuwaiti Press Scene". Middle Eastern Studies: 478. Archived from the original on 6 August 2017. ^ Robert F. Worth. "In Democracy Kuwait Trusts, but Not Much". New York Times. Archived from the original on 17 July 2016. Retrieved 12 March 2016. ^ Selvik, Kjetil (2011). "Elite Rivalry in a Semi-Democracy: The Kuwaiti Press Scene". Middle Eastern Studies. 47 (3): 477–496. doi:10.1080/00263206.2011.565143. ^ Ulrichsen, Kristian Coates (2014). "Politics and Opposition in Kuwait: Continuity and Change". Journal of Arabian Studies: Arabia, the Gulf, and the Red Sea. 4 (2): 214–230. doi:10.1080/21534764.2014.974323. ^ "Freedom in the World: Kuwait". Freedom House. 2011. Archived from the original on 7 March 2013. Retrieved 25 June 2012. ^ "The origins of Kuwait's National Assembly" (PDF). London School of Economics. p. 7. Archived (PDF) from the original on 16 November 2016. ^ a b c Barry Rubin (2013). Crises in the Contemporary Persian Gulf. Routledge. p. 92. ISBN 978-1-135-28882-2. Archived from the original on 19 February 2016. ^ a b F. Gregory Gause (1994). Oil Monarchies: Domestic and Security Challenges in the Arab Gulf States. pp. 69–70. ISBN 978-0-87609-151-7. Archived from the original on 19 February 2016. ^ a b "Kuwait Country Report" (PDF). Bertelsmann Foundation. p. 17. Archived (PDF) from the original on 16 November 2016. ^ a b c Nathan J. Brown. "Mechanisms of accountability in Arab governance: The present and future of judiciaries and parliaments in the Arab world" (PDF). pp. 8–18. Retrieved 12 March 2016. ^ "Kuwait court ruling may threaten economic recovery". Reuters. 15 May 2013. Archived from the original on 24 June 2013. Retrieved 1 July 2013. ^ Lindsey Stephenson (2011). "Women and the Malleability of the Kuwaiti Diwaniyya". Academia.edu. Archived from the original on 6 August 2017. ^ a b "Kuwait: Selected Issues" (PDF). p. 17. Archived (PDF) from the original on 30 October 2014. Kuwait has higher female labor market participation than other GCC countries; further improvements in labor force participation can support future growth prospects. Kuwait's labor force participation rate for Kuwaiti women (53 percent) is slightly above the world average (51 percent) and much higher than the MENA average (21 percent). ^ Fund, International Monetary (2012). Kuwait: Selected Issues and Statistical Appendix. International Monetary Fund. p. 43. ISBN 978-1-4755-2741-4. ^ "Kuwait: Security, Reform, and U.S. Policy" (PDF). Congressional Research Service. 30 August 2013. p. 10. Archived (PDF) from the original on 14 September 2013. ^ "Kuwaiti Constitution". World Intellectual Property Organization. Archived from the original on 12 August 2014. The Kuwait Legal system is based on civil law jurisdiction; it is derived from Egyptian and French laws. ^ "Doing business in Kuwait". Practical Law. Thomson Reuters. Archived from the original on 4 March 2016. Retrieved 12 March 2016. ^ "Doing Business in Kuwait: A tax and legal guide" (PDF). Archived (PDF) from the original on 14 July 2017. ^ Nyrop, Richard F. (1985). "Persian Gulf states: Country Studies": 80. In addition, Kuwait has established a secular legal system, unique among the Gulf states. ^ a b Hopkins, Nicholas S.; Ibrahim, Saad Eddin, eds. (1997). Arab Society: Class, Gender, Power, and Development (3rd. ed.). Cairo, Egypt: American University of Cairo. p. 417. ISBN 9789774244049. ^ "The Legal System of Kuwait: An Evaluation Of Its Applicability". academia.edu. p. 4. Archived from the original on 6 August 2017. ^ Maddex, Robert L. (5 March 2014). Constitutions of the World. Abingdon, UK: Routledge. p. 153. ISBN 978-1-136-21789-0. ^ Liebesny, Herbert J. (1974). The Law of the Near and Middle East: Readings, Cases, and Materials. Albany, New York: State University of New York Press. p. 110. ISBN 978-0-87395-256-9. ^ "State of Kuwait, Public Administration Country Profile" (PDF). United Nations. September 2004. p. 7. Archived (PDF) from the original on 10 August 2014. ^ "State of Kuwait". London School of Economics. 21 March 2011. Archived from the original on 1 November 2014. The court system in Kuwait is secular and tries both civil and criminal cases. ^ a b c Price, David (2009). The Development of Intellectual Property Regimes in the Arabian Gulf States: Infidels at the Gates. Abingdon, UK: Routledge-Cavendish. p. 23. ISBN 978-1-134-02496-4. ^ Hafeez, Zeeshan Javed. Islamic Commercial Law and Economic Development. San Fabcisco, California: Heliographica. p. 10. ISBN 978-1-933037-09-7. ^ "Gulf parliaments' war on alcohol". Gulf News. Archived from the original on 27 December 2016. ^ "Kuwait's Recent Efforts in Recognizing the Rights of Domestic Workers". Human Rights Brief. Archived from the original on 3 July 2016. ^ "Kuwait Stumbles Amid Critical Reform". Stratfor. Archived from the original on 10 October 2017. ^ "International Labour Organization/Kuwait: Removal from List of Countries Violating Workers' Rights". Library of Congress. Archived from the original on 10 October 2017. ^ "Kuwait: 10 Years for Criticizing Neighboring Rulers". Human Rights Watch. 7 June 2012. ^ "Kuwaiti man sentenced to 10 years' imprisonment for 'insulting' Tweets". Amnesty International. 7 June 2012. ^ a b Yetiv, Steve (1995). America and the Persian Gulf: The Third Party Dimension in World Politics. Westport, Connecticut: Greenwood Publishing Group. p. 51. ISBN 978-0-275-94973-0. ^ Wallace, Charles P. (20 July 1987). "No Military Bases for U.S., Kuwait Says". Los Angeles Times. Archived from the original on 26 July 2014. ^ "Official: Kuwait largest Arab investor in Germany". Middle East Monitor. 8 November 2018. Retrieved 8 November 2018. ^ "Bubiyan (island, Kuwait)". Encyclopædia Britannica. Archived from the original on 10 December 2008. Retrieved 28 June 2010. ^ Pendick, Daniel. "Kuwaiti Oil Lakes". Encarta. Archived from the original on 1 November 2009. ^ "The Economic and Environmental Impact of the Gulf War on Kuwait and the Persian Gulf". American.edu. Archived from the original on 29 July 2010. Retrieved 28 June 2010. ^ "Kuwait (country)". Encarta. Archived from the original on 1 November 2009. ^ "Kuwait: Climate". Encyclopædia Britannica. Archived from the original on 4 June 2008. Retrieved 28 June 2010. ^ Masters, Jeff (15 January 2012). "2012: Earth's 10th warmest year on record, and warmest with a La Niña – New country and territory hottest temperature records set in 2012". Weather Underground. Retrieved 18 August 2014. ^ "Kuwait City climate guide". Weather2Travel. Retrieved 25 April 2018. ^ "Temperature, Climograph, Climate table for Kuwait City". Climate-Data.org. Retrieved 25 April 2018. ^ a b c Ramsar. "Kuwait becomes Ramsar state". BirdGuides. Archived from the original on 19 February 2016. Retrieved 7 September 2015. ^ Lepage, Denis. "Checklist of birds of Kuwait". Bird Checklists of the World. Avibase. Archived from the original on 29 September 2007. ^ a b c d e f g h i "National Biodiversity Strategy for the State of Kuwait". p. 12. Archived from the original on 19 February 2016. ^ a b c d e F. Hamoda, Mohamed (September 2001). "Desalination and water resource management in Kuwait". Desalination. 138 (1–3): 165. doi:10.1016/S0011-9164(01)00259-4. ^ a b c "Irrigation in the near east region in figures". Food and Agriculture Organization. Archived from the original on 11 October 2016. Retrieved 12 March 2016. ^ "Regulations of Wastewater Treatment and Reuse in Kuwait". Beatona. Archived from the original on 19 February 2016. Retrieved 12 March 2016. ^ "10 Most Valuable Currencies in the World". Silicon India. 21 March 2012. Archived from the original on 16 March 2015. ^ a b "GDP per capita, PPP (current international $)", World Development Indicators database Archived 28 February 2017 at the Wayback Machine, World Bank. Database updated on 14 April 2015. ^ GDP – per capita (PPP) Archived 13 June 2007 at the Wayback Machine, The World Factbook, Central Intelligence Agency. ^ Economic Outlook Database, October 2015 Archived 29 January 2016 at the Wayback Machine, International Monetary Fund. Database updated on 6 October 2015. ^ a b "The World Factbook". CIA Factbook. Archived from the original on 20 December 2016. ^ Al-Kharafi, Naeimah (12 October 2014). "Encouraging social entrepreneurship in Kuwait – Special report". Kuwait Times. Archived from the original on 29 November 2014. ^ Saltzman, Jason (11 November 2014). "Keeping Up With Kuwaiti Connection: The Startup Circuit In Kuwait Is Up And At 'Em". Entrepreneur Middle East. Archived from the original on 24 November 2014. ^ Etheridge, Jamie (27 February 2014). "What's behind the growth of Kuwait's informal economy". Kuwait Times. Archived from the original on 29 November 2014. ^ Greenfield, Rebecca (12 July 2013). "In Kuwait, Instagram Accounts Are Big Business". The Wire: News for the Atlantic. Archived from the original on 29 November 2014. ^ Kuo, Lily; Foxman, Simone (16 July 2013). "A rising class of Instagram entrepreneurs in Kuwait is selling comics, makeup and sheep". Quartz. Archived from the original on 23 November 2014. ^ "Kuwait's booming Instagram economy". kottke.org. 12 July 2013. Archived from the original on 29 November 2014. ^ "Citing Security Concerns, Kuwait Bans Entry to These Nationalities". Al Bawaba. 8 November 2018. Retrieved 8 November 2018. ^ "Kuwait Re-Activates Ban on Bangladeshi Workers". Al Bawaba. 5 March 2018. Retrieved 8 November 2018. ^ "Kuwait Investment Authority Profile Page". Sovereign Wealth Fund Institute. Archived from the original on 8 March 2016. Retrieved 12 March 2016. ^ a b c d e f g h i j k l m Michael Herb (2014). The Wages of Oil: Parliaments and Economic Development in Kuwait and the UAE. Cornell University Press. ISBN 978-0-8014-5468-4. Archived from the original on 19 May 2015. ^ "Mega-projects boost hospital capacity in Kuwait". Oxford Business Group. 2016. Archived from the original on 20 December 2016. ^ "MidEast's largest hospital to open in Kuwait by end of 2016". 2016. Archived from the original on 13 December 2016. ^ "Patents By Country, State, and Year – All Patent Types". United States Patent and Trademark Office. Archived from the original on 3 March 2016. Retrieved 12 March 2016. ^ "Arab World to have more than 197 million Internet users by 2017, according to Arab Knowledge Economy Report". Archived from the original on 29 November 2014. To date, the United States Patent and Trademark Office (USPTO) have granted 858 patents to the Kingdom of Saudi Arabia, positioning it 29th in the world. Kuwait is at second place with 272 patents and Egypt at third with 212 patents, so far. ^ a b "Arab Economy Knowledge Report 2014" (PDF). pp. 20–22. Archived (PDF) from the original on 29 November 2014. ^ "UNESCO Science Report 2005" (PDF). p. 162. Archived (PDF) from the original on 7 December 2014. ^ "Regional Profile of the Information Society in Western Asia" (PDF). p. 53. Archived (PDF) from the original on 22 August 2017. ^ "Arab states" (PDF). pp. 264–265. Archived (PDF) from the original on 11 October 2016. ^ "Science and Technology in the OIC Member Countries" (PDF). p. 7. Archived (PDF) from the original on 20 December 2014. ^ a b "Kuwait Sees Fastest Growth of GCC Countries in Obtaining U.S. Patents". Yahoo News. Archived from the original on 9 April 2016. Retrieved 12 March 2016. ^ "Arab World needs to rise to the literacy challenge". Emirates 247. 28 July 2010. Archived from the original on 4 February 2016. ^ a b c "New schools to meet growing demand in Kuwait". Archived from the original on 2 February 2016. ^ "Kuwait's new curriculum to be ready in two years". Archived from the original on 4 February 2016. ^ "Travel & Tourism Economic Impact 2015" (PDF). World Travel & Tourism Council. Archived (PDF) from the original on 11 October 2016. ^ "Kuwait's investments in travel and tourism sector to grow by 4.3% per annum". BQ Magazine. Archived from the original on 21 September 2016. ^ "Kuwait tenth in total Arab countries' tourism revenue". Archived from the original on 28 August 2016. ^ a b "Hala February kicks off with a bang". Kuwait Times. Archived from the original on 13 September 2016. ^ "Hala Febrayer 2016 Carnival attracts thousands of participants". Al Bawaba. Archived from the original on 11 September 2016. ^ "Ooredoo Sponsors Kuwait's Biggest Annual Festival". Archived from the original on 11 October 2016. ^ "Flag-hoisting ceremony signals start of Kuwait national celebrations of 2017". Kuwait Times. 3 February 2017. Archived from the original on 3 February 2017. Retrieved 25 February 2017. ^ "Kuwait's ports continue to break records – Transportation". ArabianBusiness.com. 4 June 2007. Retrieved 28 June 2015. ^ John Pike. "Mina Al Ahmadi, Kuwait". Globalsecurity.org. Archived from the original on 20 July 2015. Retrieved 28 June 2015. ^ "Kuwait residency cap for expats touches off maelstrom". Gulf News. 1 February 2014. Archived from the original on 6 February 2014. ^ "Expat Insider 2017: Comparing Expat Life in the GCC States". www.internations.org. Retrieved 5 March 2018. ^ "Kuwait MP seeks five-year cap on expat workers' stay". Gulf News. 30 January 2014. Archived from the original on 28 March 2014. ^ "Kuwait 2016 Crime & Safety Report". Bureau of Diplomatic Security. 2016. Archived from the original on 13 December 2016. Retrieved 22 July 2016. ^ "How one country came together after a terror attack". BBC. 2015. Archived from the original on 7 April 2016. Retrieved 12 March 2016. ^ "The Evolution of U. S.-Turkish Relations in a Transatlantic Context" (PDF). Strategic Studies Institute. p. 87. Archived from the original (PDF) on 18 March 2015. ^ Butenschøn, Nils August; Davis, Uri; Hassassian, Manuel Sarkis (2000). Citizenship and the State in the Middle East: Approaches and Applications. Nils August Butenschøn, Uri Davis, Manuel Sarkis Hassassian. p. 190. ISBN 9780815628293. ^ Binder, Leonard (1999). Ethnic Conflict and International Politics in the Middle East. p. 164. ISBN 9780813016870. Archived from the original on 8 December 2013. Unlike the Shi'a of Saudi Arabia or Bahrain, the Kuwaiti Shi'a mostly are of Persian descent. ^ Hertog, Steffen; Luciani, Giacomo; Valeri, Marc (2013). Business Politics in the Middle East. Rivka Azoulay. p. 71. ISBN 9781849042352. Archived from the original on 20 August 2017. ^ Ende, Werner; Steinbach, Udo (2002). Islam in the World Today: A Handbook of Politics, Religion, Culture, and Society. Werner Ende, Udo Steinbach. p. 533. ISBN 978-0801464898. Archived from the original on 31 December 2013. ^ Potter, Lawrence G. (1 June 2014). Sectarian Politics in the Persian Gulf. Lawrence G. Potter. p. 135. ISBN 9780190237967. ^ Louër, Laurence (2011). Transnational Shia Politics: Religious and Political Networks in the Gulf. Laurence Louër. p. 47. ISBN 9781849042147. ^ Dénes Gazsi. "The Persian Dialects of the Ajam in Kuwait" (PDF). The University of Iowa. ^ "International Religious Freedom Report". US State Department. 1999. Archived from the original on 10 March 2016. Retrieved 12 March 2016. ^ a b "International Religious Freedom Report for 2007". US State Department. 2007. Archived from the original on 18 January 2016. Retrieved 12 March 2016. ^ "البهائيون في الكويت 100 منتمٍ... ومحفل يديره تسعة أشخاص". Al Rai (in Arabic). Archived from the original on 6 July 2015. ^ "خالد الرشيد: "اللهجة الكويتية" "مظلومة" في مدارسنا.. لأن أغلب معلمينا وافدون". 20 January 2015. Archived from the original on 20 January 2015. ^ "page 28" (PDF). Archived (PDF) from the original on 13 July 2016. ^ Binder, Leonard (164). Ethnic Conflict and International Politics in the Middle East. p. 1999. ISBN 978-0-8130-1687-0. Unlike the Shi'a of Saudi Arabia or Bahrain, the Kuwaiti Shi'a mostly are of Persian descent. ^ Alhabib, Mohammad E. (2010). The Shia Migration from Southwestern Iran to Kuwait: Push-Pull Factors during the Late Nineteenth and Early Twentieth Centuries. Georgia State University (Thesis). Archived from the original on 27 December 2016. ^ Taqi, Hanan (2010). Two ethnicities, three generations: Phonological variation and change in Kuwait (PDF) (PhD). Newcastle University. Archived (PDF) from the original on 19 October 2013. ^ Al-Tajir (2013). Lang & Linguistic in Bahrain. Al-Tajir. p. 11. ISBN 9781136136269. Archived from the original on 5 January 2014. Abu-Hakima, Ahmad Mustafa, ed. (1983). The Modern History of Kuwait: 1750–1965. London: Luzac & Company. ISBN 978-0-7189-0259-9. Abu-Hakima, Ahmad Mustafa, ed. (1965). History of Eastern Arabia, 1750–1800: The rise and development of Bahrain and Kuwait. Bahrain: Khayats. Tétreault, Mary Ann, ed. (2000). Stories of Democracy: Politics and Society in Contemporary Kuwait. New York: Columbia University Press. ISBN 978-0-231-11488-2. Wikivoyage has a travel guide for Kuwait. This page was last edited on 17 April 2019, at 10:09 (UTC).